The New comprehensive guidelines of congenital diaphragmatic hernia have been created to provide standardized care of the children through their three phases of childhood: prenatal, postnatal and teenage years.It aims to help physicians to diagnose and manage the condition from the time of diagnosis to their teenage years and has been published in in CMAJ (Canadian Medical Association Journal).The authors consulted existing recommendations before creating their own and note that the new Canadian guidelines are more in-depth than the guidelines from Europe. The new guidelines also cover all aspects of care for congenital diaphragmatic hernia rather than specific lung problems, which recent guidelines from the American Heart Association/American Thoracic Society focus on. 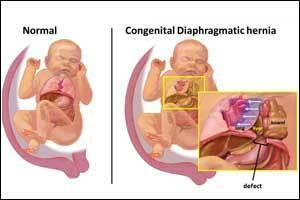 A congenital diaphragmatic hernia is a “hole” in the diaphragm muscle through which the intestines can move into the chest, thereby causing serious problems including death. Improvements in neonatal care have improved survival rates of these babies from 50% to 80% in the last 30 years, but survivors can experience significant long-term health issues that affect feeding, growth and brain development as well as the lungs, heart and thoracic cage. A key recommendation from the Canadian guidelines is long-term observation and management. “Long-term disability surveillance is essential, especially in high-risk patients, and should be managed by interdisciplinary teams of primary care physicians, pediatricians, pediatric subspecialists, pediatric surgeons and other allied health professionals,” the authors conclude. The severity of congenital diaphragmatic hernia (CDH) can be estimated prenatally using observed-to-expected lung–head ratios (by ultrasound) and total fetal lung volumes (by magnetic resonance imaging), as well as fetal liver position. Infants with CDH require intensive cardiopulmonary support after birth, including immediate endotracheal intubation and “gentle ventilation,” as well as judicious fluid and inotropic support. Pulmonary hypertension, as assessed by echocardiography, may require the use of pulmonary vasodilators and other medical adjuncts (e.g., prostaglandin E1, milrinone) or, in severe cases, extracorporeal life support, if available. Open surgical repair of the diaphragmatic defect should usually be delayed until physiologic stability has been achieved, but a failure to perform surgery within the first two weeks of life should prompt a team discussion of priorities with the family. Infants with CDH should undergo long-term, multidisciplinary surveillance that includes standardized neurodevelopmental testing, especially if they are considered high risk (i.e., needing pulmonary support at 30 days, needing a patch repair or requiring extracorporeal life support).